After several hours of debate and argument, Ilocos Norte Governor Imee Marcos and provincial board members apologized to the House of Representatives and to Majority Leader and Ilocos Norte 1st District Representative Rodolfo Fariñas for a resolution and a draft resolution which offended lawmakers. One by one, members of the board present during a Thursday, August 31 hearing into the alleged misuse of tobacco funds in the province, apologized to both the House and Fariñas. Several of the board members were either personal friends or former local government subordinates of Fariñas himself. The House committee on good government and public accountability had earlier criticized two resolutions – one which was passed and the other, shelved – regarding an ongoing inquiry. One resolution declared Fariñas, former Ilocos Norte governor, persona non grata over the probe. Another resolution condemned the probe, criticizing the “tyranny” of the House and accusing lawmakers of holding the probe “in aid of [their] political ambition.” This resolution was eventually archived. The House committee ordered the provincial board members to explain why they should not be held in contempt for the two resolutions. “I will propose that in their next session, it be withdrawn with apologies. I think we were all inflamed with concern and worry, and as a result, are very, very sorry that this may, in some way or another, offended or interfered in the operations of the House,” said Marcos, who had signed the resolution declaring Fariñas persona non grata. After their apologies, Fariñas proposed to “just forgive” the Ilocos Norte officials. The crowd, composed primarily of Ilocos Norte officials and House staff, erupted into applause. Fariñas, however, warned that the House would not be as kind should the incident happen again. “Let this serve as a warning to all other entities to respect also the proceedings of the House because a repetition of such an offense will be dealt with more severely by the House,” he said. The House, because of a resolution filed by Fariñas, is looking into the alleged misuse of tobacco funds in the purchase of vehicles for Ilocos Norte. During Thursday’s hearing, documents from the vehicle seller and the local government indicated a P195,000 difference between the selling price and the purchase price declared by the local government. Six Ilocos Norte officials – those involved in the purchase of the vehicles – were detained by the House for nearly two months for refusing to answer questions properly. House Majority Floor Leader Rodolfo Fariñas has called out Ilocos Norte Governor Imee Marcos for her “very cheap and wild desperation shot,” after she accused him of stealing the original documents on transactions using proceeds from the tobacco excise tax. Marcos claimed in a Wednesday statement that Fariñas’ personnel swiped the original documents from the Commission on Audit’s office inside the provincial capitol. She added that the Ilocos Six officials only declined to give sworn statements on the photocopies presented to avoid the risk of committing perjury. “Really? Who’s using the loss of the originals as an alibi in not remembering the transactions under question?” he exclaimed. “She even borrowed a line from the Game of Thrones that the North remembers! Really? How come the Amnesiac 6 do not remember the P66.45M cash advances that Imee gave them?” Fariñas said. 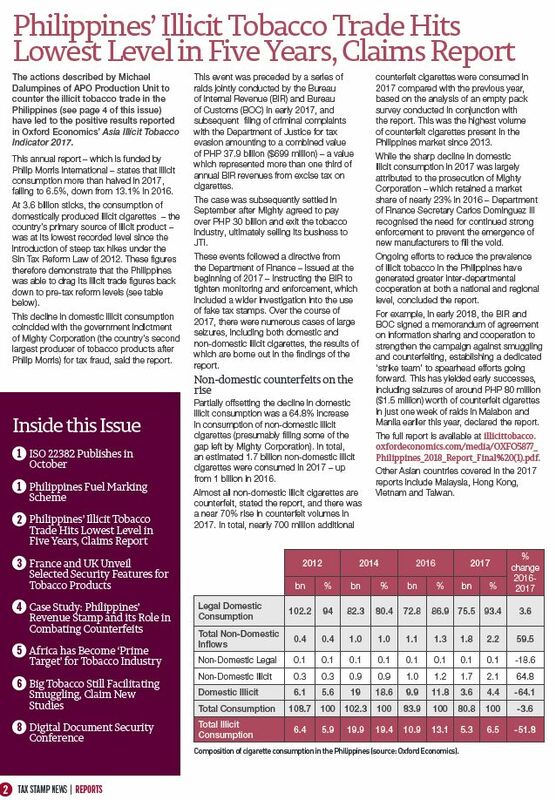 “The public clearly sees who is spending millions of pesos to cover up the loss of the bulk of P66.45M of tobacco funds,” he said. The Ilocos Six refers to the following employees: provincial planning and development officer and bids and awards committee chair Pedro Agcaoili, provincial budget officer Evangeline Tabulog, provincial treasurer Josephine Calajate, accountant Eden Battulayan, and treasury office staff Genedine Jambaro and Encarnacion Gaor. MANILA, Philippines – The House of Representatives has issued a subpoena for Ilocos Norte Governor Imee Marcos to appear at the July 25 hearing on the alleged misuse of P66.45 million worth of provincial tobacco funds. 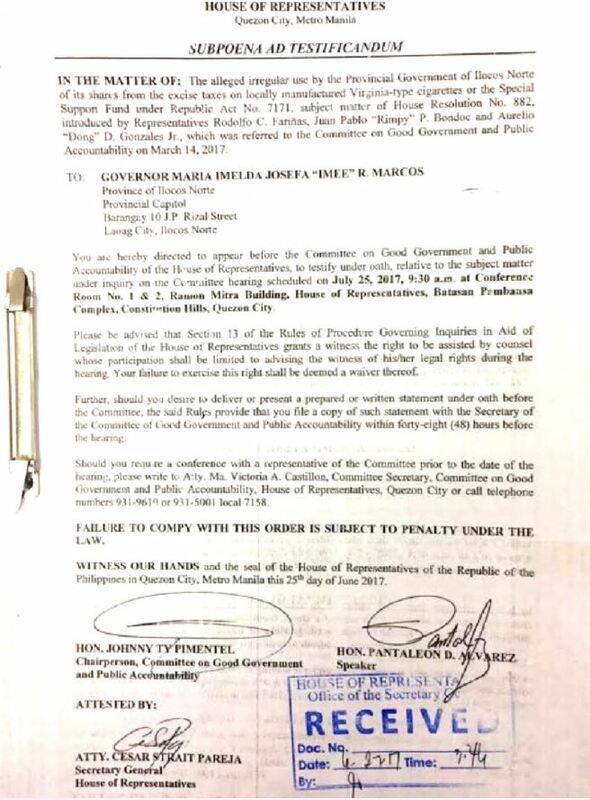 The subpoena was signed by Speaker Pantaleon Alvarez, House committee on good government and public accountability committee chairperson Johnny Pimentel, and House Secretary-General Cesar Pareja on Tuesday, June 27. A copy of the document was given to reporters on Wednesday, June 28. Marcos is allowed to bring a lawyer to assist her in answering the lawmakers’ questions. Should she refuse to be assisted by a legal counsel, the governor must issue a waiver. She must also give the House a copy of a written statement she plans to read as testimony two days ahead of the hearing. Marcos may also request for a conference with any member of the House good government and public accountability panel. If Marcos fails to show up on July 25, the committee will cite her in contempt and move to detain her in the House. Her detention room is already being prepared. The House is investigating the province’s tobacco funds after Ilocos Norte 1st District Representative Rodolfo Fariñas, the House Majority Leader and former Ilocos Norte governor, uncovered various documents indicating the money was used to purchase 40 mini-cabs, 5 secondhand buses, and 70 Foton mini trucks. Under Republic Act Number 7171, 15% of tobacco excise taxes shall be allotted for a special support fund for tobacco farmers in the identified provinces, mostly in the Ilocos region. The money, however, should only be used for cooperative, livelihood, agro-industrial, and infrastructure projects. Marcos has ignored previous invitations to appear in the hearings, only sending a letter to the committee maintaining the purchases were aboveboard and benefitted farmers. Rappler, however, discovered documents showing Ilocos Norte’s tobacco funds go to Marcos’ pet projects. The House is preparing her detention room after she said her brother, former senator Ferdinand “Bongbong” Marcos Jr, had advised her against testifying before lawmakers. Six Ilocos Norte officials have been detained for giving “dismissive” answers during the hearings. The Court of Appeals had ordered their provisional release, but this was ignored by the House leadership. Health Secretary Paulyn Ubial said Tuesday. “We are looking at coming out with the IRR inside the 60-day effectivity period provided by the EO, likely before SONA,” said Ubial. Ubial said they are already crafting the IRR along with Philippine Amusement and Gaming Corp., Philippine Ports Authority, Land Transportation Office, Civil Aviation Authority of the Philippines, Maritime Industry Authority, Department of Tourism, Office of the President, Department of Environment and Natural Resources, Department of Justice, Department of Interior and Local Government, Department of Education, and Civil Service Commission. Noticeably absent from the list is a representative from the tobacco industry. “We don’t think that their representation would in fact add value to the EO,” said Ubial. To note, the Inter-Agency Committee-Tobacco (IAC-Tobacco) created under the Tobacco Regulation Act of 2003, has a representative of the tobacco industry as among its members. Earlier this month, President Rodrigo Duterte signed EO 26, which imposes a nationwide smoking ban in public places. The IRR is expected to complement the provisions of the EO 26. But even without the IRR, the health chief said local government units (LGUs) may already come out with their respective tobacco control ordinances. “We hope that if we come up with the IRR, the specifics there will be clearer in the implementation. But even without the IRR, it is already implementable,” said Ubial. She said LGUs can easily refer to the Framework Convention on Tobacco Control (FCTC) as basis for their ordinances. “The FCTC is an international treaty that we signed and ratified. That can be the reference point of local ordinances,” said Ubial. For refusing to answer questions during a congressional hearing on the alleged misuse of Ilocos Norte tobacco funds, six employees of the province’s Treasurer’s Office were cited in contempt and ordered detained at the House of Representatives on Monday, May 29. Ilocos Norte Governor Imee Marcos, who is being accused by Majority Floor Leader Rodolfo Fariñas of allegedly diverting P66.45 million in tobacco funds to buy motor vehicles, was also subpoenaed by the House Committee on Good Government and Public Accountability chaired by Surigao Del Sur Rep. Johnny Pimentel to appear in the next hearing after skipping two previous hearings. Pedro Agacaoili, chairman of the office’s Bids and Awards Committee and head of the provincial and planning development office; Josephine Calajate, provincial treasurer; Edna Battulayan, accountant; provincial budget officer Evangeline Tabulog; and two other employees, Genedine Jambaro and Encarnacion Gaor, were brought to the House Sergeant-at-Arms’ office where they would be temporarily held. During the inquiry on Monday, the six employees repeatedly told the House panel that they could not recall receiving millions in cash advances or authorizing the release of funds for the purchase of various vehicles. Fariñas grilled the employees on the allegedly anomalous purchase of minicabs, buses, and trucks in 2011 and 2012 using the share of the province from tobacco funds. The lawmaker chastised the employees for their allegedly “dismissive” answers and also warned that cases against them would pile up if they continue trying to get off the hook. “Magpapalusot kayo, dadami lalo ang kaso n’yo,” said Fariñas. According to Fariñas, the vehicles were purchased through cash advances from the province’s share from excise taxes derived from locally produced cigarettes or the special support fund under Republic Act No.7171 or the Act to Promote the Development of the Farmer in the Virgina Tobacco-Producing Provinces. The lawmaker claimed the purchase of the vehicles had violated provisions of R.A. 7171 because the law mandates Virginia tobacco-producing provinces to use 15 percent of their share of excise taxes from locally produced cigarettes for projects that will help advance tobacco farmers’ self reliance through the establishment of cooperatives and livelihood, agro-industrial, and infrastructure projects. Also, Fariñas claimed there was no public bidding in the purchase of the vehicles in violation of Republic Act 9814 or the Government Procurement Reform Act. Fariñas and Marcos used to be allies under what was being pushed as the One Ilocos Norte bloc, but in 2015, they cut ties due to political differences. Imee’s mother, Imelda Romualdez-Marcos, the former first lady and wife of the late president Ferdinand Marcos, represents the second district of Ilocos Norte. Fariñas represents the First District. Both officials are in their last terms in the House and will serve only until 2019. In an about face move that demonstrated stronger support for the country’s public health, the government said on Wednesday that it refused to deliberate the controversial tobacco bill, which seeks to boost cigarette production while dismissing the dangers of smoking. This is the second time the government has rejected such a proposal from the House of Representatives after the bill was also voided last year following opposition from the Health Ministry to jointly deliberating the bill. Ending his ambivalence on tobacco, President Joko “Jokowi” Widodo, whose administration had earlier issued a road map for the industry that sought to triple cigarette production to 524 billion by 2020, made a bold move that puts him against one of the country’s oldest industries and which employs millions of workers. Cabinet Secretary Pramono Anung said Jokowi would not issue a presidential letter (Surpres) to approve the House proposal to start discussion of the bill. Without the letter, the House cannot begin deliberations because all bills must be both discussed by representatives of the government and the House. If the House does not receive a letter from the government by the given deadline of March 19, the bill will be voided. “There is no Surpres [to be issued by the President in this case],” Pramono told reporters at the State Palace, adding that the President had instructed Trade Minister Enggartiasto Lukita and State Secretary Pratikno to pay a visit to the House to deliver the government’s stance. During a Cabinet meeting on Tuesday, Health Minister Nila Moeloek, Manpower Minister Hanif Dhakiri and Industry Minister Airlangga Hartarto told Jokowi that if the bill was passed into law then it would contravene a number of prevailing laws handled by the three ministries. The Health Ministry has long campaigned for stronger tobacco control, which is crucial to saving around 200,000 Indonesians who die every year from tobacco-related illnesses and to save Rp 378 trillion (US$28.35 billion) in economic losses caused by smoking. In his opening remarks during Tuesday’s Cabinet meeting, Jokowi, however, expressed doubts on the matter, saying that he could understand the concerns raised by the Health Ministry because the government had to take care of the health of its people, but the welfare of those who worked in tobacco industry should also be taken into consideration. The bill was initially dropped from the 2016 National Legislation Program (Prolegnas) by the Health Ministry, which was appointed by Jokowi to lead the discussion at the House. However, the comeback of Golkar Party politician Setya Novanto as House speaker paved the way for the inclusion of the bill in the 2017 Prolegnas. Separately, the House Legislation Body (Baleg), which is assigned to deliberate the bill, has reminded the government to be cooperative, arguing that the bill will protect the domestic tobacco industry, while at the same time benefiting local tobacco farmers. “If the government refuses to discuss the bill, which is the initiative of the House, we will also refuse to deliberate any bills initiated by the government in the future,” Baleg deputy speaker Firman Subagyo of Golkar said on Wednesday. The politician suspected foreign intervention in pushing the government to kill the bill, as the draft restricted foreign tobacco companies operating in the country. Firman said the majority of political factions at the House shared the same opinion and thus agreed to continue the deliberation.